Few cancer mechanisms are as devastating as the generation of cancer stem cells, which arise in leukemia from white blood cell precursors. The mechanisms of this transition have been obscure, but the consequences are all too clear. Leukemia stem cells promote an aggressive, therapy-resistant form of disease called blast crisis. Delving into the mechanisms by which leukemia stem cells are primed, a team of scientists at the University of California, San Diego (UCSD), uncovered a misfiring RNA-editing system. The main problem the scientists found was an enzyme called ADAR1 (adenosine deaminase acting on RNA1), which mediates post-transcriptional adenosine-to-inosine (A-to-I) RNA editing. ADAR1 can edit the sequence of microRNAs (miRNAs), small pieces of genetic material. By swapping out just one miRNA building block for another, ADAR1 alters the carefully orchestrated system cells use to control which genes are turned on or off at which times. ADAR1 is known to promote cancer progression and resistance to therapy. To study ADAR1, the UCSD team used human blast crisis chronic myeloid leukemia (CML) cells in the lab, and mice transplanted with these cells, to determine the enzyme’s role in governing leukemia stem cells. The scientists, led by Catriona Jamieson, M.D., Ph.D., published their work June 9 in Cell Stem Cell, in an article entitled, “ADAR1 Activation Drives Leukemia Stem Cell Self-Renewal by Impairing Let-7 Biogenesis.” The article presented the first mechanistic link between pro-cancer inflammatory signals and RNA editing–driven reprogramming of precursor cells into leukemia stem cells. The article describes how ADAR1-mediated A-to-I RNA editing is activated by Janus kinase 2 (JAK2) signaling and BCR-ABL1 signaling. 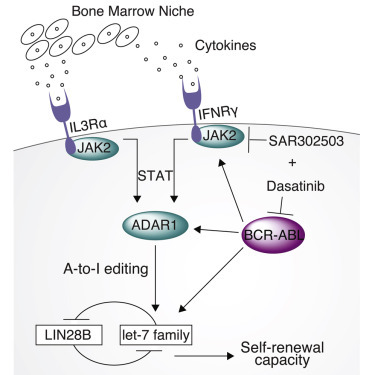 Also, it indicated, in a model of blast crisis (BC) CML, that combined JAK2 and BCR-ABL1 inhibition prevents leukemia stem cell self-renewal commensurate with ADAR1 downregulation. Essentially, the scientists were able to trace a series of molecular events: First, white blood cells with a leukemia-promoting gene mutation become more sensitive to signs of inflammation. That inflammatory response activates ADAR1. Then, hyper-ADAR1 editing slows down the miRNAs known as let-7. Ultimately, this activity increases cellular regeneration, or self-renewal, turning white blood cell precursors into leukemia stem cells. After learning how the ADAR1 system works, Dr. Jamieson’s team looked for a way to stop it. By inhibiting sensitivity to inflammation or inhibiting ADAR1 with a small-molecule tool compound, the researchers were able to counter ADAR1’s effect on leukemia stem cell self-renewal and restore let-7. Self-renewal of blast crisis CML cells was reduced by approximately 40% when treated with the small molecule called 8-Aza as compared to untreated cells. “In this study, we showed that cancer stem cells co-opt a RNA editing system to clone themselves. What’s more, we found a method to dial it down,” said Dr. Catriona Jamieson. “Based on this research, we believe that detecting ADAR1 activity will be important for predicting cancer progression. Post-transcriptional adenosine-to-inosine RNA editing mediated by adenosine deaminase acting on RNA1 (ADAR1) promotes cancer progression and therapeutic resistance. However, ADAR1 editase-dependent mechanisms governing leukemia stem cell (LSC) generation have not been elucidated. In blast crisis chronic myeloid leukemia (BC CML), we show that increased JAK2 signaling and BCR-ABL1 amplification activate ADAR1. In a humanized BC CML mouse model, combined JAK2 and BCR-ABL1 inhibition prevents LSC self-renewal commensurate with ADAR1 downregulation. Lentiviral ADAR1 wild-type, but not an editing-defective ADAR1E912A mutant, induces self-renewal gene expression and impairs biogenesis of stem cell regulatory let-7 microRNAs. Combined RNA sequencing, qRT-PCR, CLIP-ADAR1, and pri-let-7 mutagenesis data suggest that ADAR1 promotes LSC generation via let-7 pri-microRNA editing and LIN28Bupregulation. A small-molecule tool compound antagonizes ADAR1’s effect on LSC self-renewal in stromal co-cultures and restores let-7 biogenesis. Thus, ADAR1 activation represents a unique therapeutic vulnerability in LSCs with active JAK2 signaling. BackgroundIn advanced human malignancies, RNA sequencing (RNA-seq) has uncovered deregulation of adenosine deaminase acting on RNA (ADAR) editases that promote therapeutic resistance and leukemia stem cell (LSC) generation. Chronic myeloid leukemia (CML), an important paradigm for understanding LSC evolution, is initiated by BCR-ABL1 oncogene expression in hematopoietic stem cells (HSCs) but undergoes blast crisis (BC) transformation following aberrant self-renewal acquisition by myeloid progenitors harboring cytokine-responsive ADAR1 p150 overexpression. Emerging evidence suggests that adenosine to inosine editing at the level of primary (pri) or precursor (pre)-microRNA (miRNA), alters miRNA biogenesis and impairs biogenesis. However, relatively little is known about the role of inflammatory niche-driven ADAR1 miRNA editing in malignant reprogramming of progenitors into self-renewing LSCs. Primary normal and CML progenitors were FACS-purified and RNA-Seq analysis as well as qRT-PCR validation were performed according to published methods (Jiang, 2013). MiRNAs were extracted from purified CD34+ cells derived from CP, BC CML and cord blood by RNeasy microKit (QIAGEN) and let-7 expression was evaluated by qRT-PCR using miScript Primer assay (QIAGEN). CD34+ cord blood (n=3) were transduced with lentiviral human JAK2, let-7a, wt-ADAR1 and mutant ADAR1, which lacks a functional deaminase domain. Because STAT signaling triggers ADAR1 transcriptional activation and both BCR-ABL1 and JAK2 activate STAT5a, nanoproteomics analysis of STAT5a levels was performed. Engrafted immunocompromised RAG2-/-γc-/- mice were treated with a JAK2 inhibitor, SAR302503, alone or in combination with a potent BCR-ABL1 TKI Dasatinib, for two weeks followed by FACS analysis of human progenitor engraftment in hematopoietic tissues and serial transplantation. RNA-seq and qRT-PCR analysis in FACS purified BC CML progenitors revealed an over-representation of inflammatory pathway activation and higher levels of JAK2-dependent inflammatory cytokine receptors, when compared to normal and chronic phase (CP) progenitors. Moreover, RNA-seq and qRT-PCR analysis showed decreased levels of mature let-7 family of stem cell regulatory miRNA in BC compared to normal and CP progenitors. Lentiviral human JAK2 transduction of CD34+ progenitors led to an increase of ADAR1 transcript levels and to a reduction in let-7 family members. Interestingly, lentiviral human JAK2 transduction of normal progenitors enhanced ADAR1 activity, as revealed by RNA editing-specific qRT-PCR and RNA-seq analysis. Moreover, qRT-PCR analysis of CD34+ progenitors transduced with wt-ADAR1, but not mutant ADAR1 lacking functional deaminase activity, reduced let-7 miRNA levels. These data suggested that ADAR1 impairs let-7 family biogenesis in a RNA editing dependent manner. Interestingly, RNA-seq analysis confirmed higher frequency of A-to-I editing events in pri- and pre-let-7 family members in CD34+ BC compared to CP progenitors, as well as normal progenitors transduced with human JAK2 and ADAR1-wt, but not mutant ADAR1. Lentiviral ADAR1 overexpression enhanced CP CML progenitor self-renewal and decreased levels of some members of the let-7 family. In contrast, lentiviral transduction of human let-7a significantly reduced self-renewal of progenitors. In vivo treatments with Dasatinib in combination with a JAK2 inhibitor, significantly reduced self-renewal of BCR-ABL1 expressing BC progenitors in the bone marrow thereby prolonging survival of serially transplanted mice. Finally, a reduction in ADAR1 p150 transcripts was also noted following combination treatment only suggesting a role for ADAR1 in CSC propagation. This is the first demonstration that intrinsic BCR-ABL oncogenic signaling and extrinsic cytokines signaling through JAK2 converge on activation of ADAR1 that drives LSC generation by impairing let-7 miRNA biogenesis. Targeted reversal of ADAR1-mediated miRNA editing may enhance eradication of inflammatory niche resident cancer stem cells in a broad array of malignancies, including JAK2-driven myeloproliferative neoplasms. Disclosures: Jamieson: J&J: Research Funding ; GSK: Research Funding . Interferons (IFNs) are cytokines with important anti-proliferative activity and exhibit key roles in immune surveillance against malignancies. Early work initiated over 3 decades ago led to the discovery of IFN receptor activated Jak-Stat pathways and provided important insights into mechanisms for transcriptional activation of interferon stimulated genes (ISGs) that mediate IFN-biological responses. Since then, additional evidence has established critical roles for other receptor activated signaling pathways in the induction of IFN-activities. These include MAPK pathways, mTOR cascades and PKC pathways. In addition, specific microRNAs (miRNAs) appear to play a significant role in the regulation of IFN-signaling responses. This review focuses on the emerging evidence for a model in which IFNs share signaling elements and pathways with growth factors and tumorigenic signals, but engage them in a distinctive manner to mediate anti-proliferative and antiviral responses. Because of their antineoplastic, antiviral, and immunomodulatory properties, recombinant interferons (IFNs) have been used extensively in the treatment of various diseases in humans (1). IFNs have clinical activity against several malignancies and are actively used in the treatment of solid tumors such as malignant melanoma and renal cell carcinoma; and hematological malignancies, such as myeloproliferative neoplasms (MPNs) (1). In addition, IFNs play prominent roles in the treatment of viral syndromes, such as hepatitis B and C (2). In contrast to their beneficial therapeutic properties, IFNs have been also implicated in the pathophysiology of certain diseases in humans. In many cases this involvement reflects abnormal activation of the endogenous IFN system, which has important roles in various physiological processes. Diseases in which dysregulation of the Type I IFN system has been implicated as a pathogenetic mechanism include autoimmune disorders such as systemic lupus erythematosous (3), Sjogren’s syndrome (3,4), dermatomyositis (5) and systemic sclerosis (3, 4). In addition, Type II IFN (IFNγ) overproduction has been implicated in bone marrow failure syndromes, such as aplastic anemia (6). There is also recent evidence for opposing actions of distinct IFN subtypes in the pathophysiology of certain diseases. For instance, a recent study demonstrated that there is an inverse association between IFNβ and IFNγ gene expression in human leprosy, consistent with opposing functions between Type I and II IFNs in the pathophysiology of this disease (7). Thus, differential targeting of components of the IFN-system, to either promote or block induction of IFN-responses depending on the disease context, may be useful in the therapeutic management of various human illnesses. The emerging evidence for the complex regulation of the IFN-system underscores the need for a detailed understanding of the mechanisms of IFN-signaling in order to target IFN-responses effectively and selectively. It took over 35 years from the original discovery of IFNs in 1957 to the discovery of Jak-Stat pathways (8). The identification of the functions of Jaks and Stats dramatically advanced our understanding of the mechanisms of IFN-signaling and had a broad impact on the cytokine research field as a whole, as it led to the identification of similar pathways from other cytokine receptors (8). Subsequently, several other IFN receptor (IFNR)-regulated pathways were identified (9). As discussed below, in recent years there has been accumulating evidence that beyond Stats, non-Stat pathways play important and essential roles in IFN-signaling. This has led to an evolution of our understanding of the complexity associated with IFN receptor activation and how interacting signaling networks determine the relevant IFN response. The interferons are classified in 3 major categories, Type I (α, β, ω, ε, τ, κ, ν); Type II (γ) and Type III IFNs (λ1, λ2, λ3) (1, 9, 10). The largest IFN-gene family is the group of Type I IFNs. This family includes 14 IFNα genes, one of which is a pseudogene, resulting in the expression of 13 IFNα protein subtypes (1, 9). There are 3 distinct IFNRs that are specific for the 3 different IFN types. All Type I IFN subtypes bind to and activate the Type I IFNR, while Type II and III IFNs bind to and activate the Type II and III IFNRs, respectively (9–11). It should be noted that although all the different Type I IFNs bind to and activate the Type I IFNR, differences in binding to the receptor may account for specific responses and biological effects (9). For instance, a recent study provided evidence that direct binding of mouse IFNβ to the Ifnar1 subunit, in the absence of Ifnar2, regulates engagement of signals that control expression of genes specifically induced by IFNβ, but not IFNα (12). This recent discovery followed original observations from the 90s that revealed differential interactions between the different subunits of the Type I IFN receptor in response to IFNβ binding as compared to IFNα binding and partially explained observed differences in functional responses between different Type I IFNs (9). A common property of all IFNs, independently of type and subtype, is the induction of antiviral effects in vitro and in vivo (1). Because of their potent antiviral properties, IFNs constitute an important element of the immune defense against viral infections. There is emerging information indicating that specificity of the antiviral response is cell type dependent and/or reflects specific tissue expression of certain IFNs. As an example, a recent comparative analysis of the involvement of the Type I IFN system as compared to the Type III IFN system in antiviral protection against rotavirus infection of intestinal epithelial cells demonstrated an almost exclusive requirement for IFNλ (Type III IFN) (13). The antiviral effects of IFNα have led to the introduction of this cytokine in the treatment of hepatitis C and B in humans (2) and different viral genotypes have been associated with response or failure to IFN-therapy (14). Most importantly, IFNs exhibit important antineoplastic effects, reflecting both direct antiproliferative responses mediated by IFNRs expressed on malignant cells, as well as indirect immunomodulatory effects (15). IFNα and its pegylated form (peg IFNα) have been widely used in the treatment of several neoplastic diseases, such as hairy cell leukemia (HCL), chronic myeloid leukemia (CML), cutaneous T cell lymphoma (CTCL), renal cell carcinoma (RCC), malignant melanoma, and myeloproliferative neoplasms (MPNs) (1, 16). Although the emergence of new targeted therapies and more effective agents have minimized the use of IFNs in the treatment of diseases like HCL and CML, IFNs are still used extensively in the treatment of melanoma, CTCL and MPNs (1, 16, 17). Notably, recent studies have provided evidence for long lasting molecular responses in patients with polycythemia vera (PV), essential thrombocytosis (ET) and myelofibrosis (MF) who were treated with IFNα (16). Beyond their inhibitory properties on malignant hematopoietic progenitors, IFNs are potent regulators of normal hematopoiesis (9) and contribute to the regulation of normal homeostasis in the human bone marrow (18). Related to its effects in the central nervous system, IFNβ has clinical activity in multiple sclerosis (MS) and has been used extensively for the treatment of patients with MS (19). The immunoregulatory properties of Type I IFNs include key roles in the control of innate and adaptive immune responses, as well as positive and negative effects on the activation of the inflammasome (15). Dysregulation of the Type I IFN response is seen in certain autoimmune diseases, such as Aicardi-Goutières syndrome (20). In fact, self-amplifying Type I IFN-production is a key pathophysiological mechanism in autoimmune syndromes (21). There is also emerging evidence that IFNλ may contribute to the IFN signature in autoimmune diseases (3). Tyrosine kinases of the Janus family (Jaks) are associated in unique combinations with different IFNRs and their functions are essential for IFN-inducible biological responses. Stats are transcriptional activators whose activation depends on tyrosine phosphorylation by Jaks (8, 9). In the case of the Type I IFN receptor, Tyk2 and Jak1 are constitutively associated with the IFNAR1 and IFNAR2 subunits, respectively (8, 9) (Fig. 1). For the Type II IFN receptor, Jak1 and Jak2 are associated with the IFNGR1 and IFNGR2 receptor subunits, respectively (8, 9) (Fig. 1). Finally, in the case of the Type III IFNR, Jak1 and Tyk2 are constitutively associated with the IFN-λR1 and IL-10R2 receptor chains, respectively (10) (Fig. 1). Upon engagement of the different IFNRs by the corresponding ligands, the kinase domains of the associated Jaks are activated and phosphorylate tyrosine residues in the intracellular domains of the receptor subunits that serve as recruitmenst sites for specific Stat proteins. Subsequently, the Jaks phosphorylate Stat proteins that form unique complexes and translocate to the nucleus where they bind to specific sequences in the promoters of ISGs to initiate transcription. A major Stat complex in IFN-signaling is the interferon stimulated gene factor 3 (ISGF3) complex. This IFN-inducible complex is composed or Stat1, Stat2 and IRF9 and regulates transcription by binding to IFN stimulated response elements (ISRE) in the promoters of a large group of IFN stimulated genes (ISGs) (8, 9). ISGF3 complexes are induced during engagement of the Type I and III IFN receptors, but not in response to activation of Type II IFN receptors (8–10) (Table 1). Beyond ISGF3, several other Stat-complexes involving different Stat homodimers or heterodimers are activated by IFNs and bind to IFNγ-activated (GAS) sequences in the promoters of groups of ISGs (8, 9). Such GAS binding complexes are induced by all different IFNs (I, II and III), although there is variability in the engagement and utilization of different Stats by the different IFN-receptors (Table 1). It should also be noted that engagement of certain Stats, such as Stat4 and Stat6, is cell type-specific and may be relevant for tissue specific functions (9). The significance of different Stat binding complexes in the induction of Type I and II IFN responses was in part addressed in a study in which Stat1 cooperative DNA binding was disrupted by generating knock-in mice expressing cooperativity-deficient STAT1 (22). As expected, Type II IFN-induced gene transcription and antibacterial responses were essentially lost in these mice, but Type I IFN-dependent recruitment of Stat1 to ISRE elements and antiviral responses were not affected (22), demonstrating the existence of important differences in Stat1 cooperative DNA binding between Type I and II IFN signaling. Type I, II, III interferon receptors subunits, associated kinases of the Janus family, and effector Stat-pathways. Note: Stat:Stat reflects multiple potential Stat:Stat compexes, as outlined in Table 2. Different Stat-DNA binding complexes induced by Type I, II and III IFNs. The nuclear translocation of Stat-proteins occurs after their activation, following phosphorylation on specific sites by Jak kinases (8, 9). It is well established that phosphorylation on tyrosine 701 is required for activation of Stat1 and phosphorylation on tyrosine 705 is required for activation of Stat3 (8, 9). Beyond tyrosine phosphorylation, phosphorylation on serine 727 in the Stat1 and Stat3 transactivation domains is required for full and optimal transcriptional activation of ISGs (8, 9). There is evidence that serine phosphorylation occurs after the phosphorylation of Stat1 on tyrosine 701 and that translocation to the nucleus and recruitment to the chromatin are essential in order for Stat1 to undergo serine 727 phosphorylation (23). Several IFN-dependent serine kinases for Stat1 have been described, raising the possibility that this phosphorylation occurs in a cell type specific manner. After the original demonstration that protein kinase C (PKC) delta (PKCδ) is a serine kinase for Stat1 and is required for optimal transcriptional activation in response to IFNα (24), extensive work has confirmed the role of this PKC isoform in the regulation of serine 727 phosphorylation in Stat1 and has been extended to different cellular systems (25–29) (Table 2). In the Type II IFN system five different serine kinases for the transactivation domain (TAD) of Stat1/phosphorylation on serine 727 have been demonstrated in different cell systems. ….. The nuclear translocation of Stat-proteins occurs after their activation, following phosphorylation on specific sites by Jak kinases (8, 9). It is well established that phosphorylation on tyrosine 701 is required for activation of Stat1 and phosphorylation on tyrosine 705 is required for activation of Stat3 (8, 9). Beyond tyrosine phosphorylation, phosphorylation on serine 727 in the Stat1 and Stat3 transactivation domains is required for full and optimal transcriptional activation of ISGs (8, 9). There is evidence that serine phosphorylation occurs after the phosphorylation of Stat1 on tyrosine 701 and that translocation to the nucleus and recruitment to the chromatin are essential in order for Stat1 to undergo serine 727 phosphorylation (23). Several IFN-dependent serine kinases for Stat1 have been described, raising the possibility that this phosphorylation occurs in a cell type specific manner. After the original demonstration that protein kinase C (PKC) delta (PKCδ) is a serine kinase for Stat1 and is required for optimal transcriptional activation in response to IFNα (24), extensive work has confirmed the role of this PKC isoform in the regulation of serine 727 phosphorylation in Stat1 and has been extended to different cellular systems (25–29) (Table 2). In the Type II IFN system five different serine kinases for the transactivation domain (TAD) of Stat1/phosphorylation on serine 727 have been demonstrated in different cell systems. …. Protein tyrosine phosphatases with regulatory effects on Jak-Stat pathways in IFN-signaling. IFN-inducible JAK-STAT, MAPK and mTOR signaling cascades are also regulated potentially by microRNAs (miRs). miRs are important regulators of post-transcriptional events, leading to inhibition of mRNA translation or mRNA degradation (105). In recent years it has become apparent that the direct regulation of STAT activity by mIRs has profound effects on consequent gene expression, specifically in the context of cytokine-inducible events (106). Pertinent for this review of IFN-inducible STAT activation, miR-145, miR-146A and miR-221/222 target STAT1 and miR-221/222 target STAT2 (106). Numerous studies describe different miRs that target STAT3: mIR-17, miR-17-5p, mIR-17-3p, mIR-18a, miR-19b, mIR-92-1, miR-20b, Let-7a, miR-106a, miR-106-25, miR-106a-362 and miR-125b (106) (Fig. 4). mIR-132, miR-212 and miR-200a have been implicated in negatively regulating STAT4 expression in human NK cells (107) and miR-222 has been shown to regulate STAT5 expression (108). In addition, JAK-STAT signaling is affected by miR targeting of suppressors of cytokine signaling (SOCS) proteins. miR-122 and miR-155 targeting of SOCS1 releases the inhibition of STAT1 (and STAT5a/b) (109–111), and mIR-19a regulation of SOCS1 and SOCS3 effectively prolongs activation of both STAT1 and STAT3 (112). There is also evidence that miR-155 targets the inositol phosphatase SHIP1, effectively prolonging/inducing IFN-γ expression (113). Much of the evidence associated with miRs prolonging JAK-STAT activation relates to cancer studies, where tumor-secreted miRs promote cell migration and angiogenesis by prolonging JAK-STAT activation (114). miR-145 targeting of SOCS7 affects nuclear translocation of STAT3 and has been associated with enhanced IFNβ production (115). Beyond inhibition of SOCS proteins, miRs may influence the expression of other inhibitory factors associated with JAK-STAT signaling, and miR-301a and miR-18a have been shown to inhibit PIAS3, a negative regulator of STAT3 activation (116). There is also the potential for STATS to directly regulate miR gene expression. STAT5 suppresses expression of miR15/16 (117) and there is evidence that there are potential STAT3 binding sites in the promoters of about 200 miRs (118). Viewed altogether, there is compelling evidence for miR-STAT interactions, yet few studies have considered the contributions of miRs to IFN-inducible JAK-STAT signaling. Targeting and regulation of various proteins known to be involved in IFN-signaling by different miRNAs. …. A substantial amount of knowledge has accumulated since the original discovery of the Jak-Stat pathway in the early 90s. It is now clear that several key signaling cascades are essential for the induction of Type I, II and III IFN-responses. The original view that IFN-signals can be transmitted from the cell surface to the nucleus in two simple steps involving tyrosine phosphorylation of Stat proteins (8) now appears somewhat simplistic, as it has been established that modifications of Jak-Stat signals by other pathways and/or simultaneous engagement of other essential complementary cellular cascades is essential for induction of ISG transcriptional activation, mRNA translation, protein expression and subsequent induction of IFN-responses. Such pathways include PKC and MAP kinase pathways and mTORC1 and mTORC2-dpendent signaling cascades. Over the next decade our understanding of the mechanisms by which IFN-signals are induced will likely continue to evolve, with the anticipated outcome that it will be possible exploit this new knowledge for translational-therapeutic purposes. For instance, selective targeting of kinase-elements of the IFN-pathway with kinase inhibitors may be useful in the treatment of autoimmune diseases where dysregulated/excessive Type I IFN production contributes to the pathophysiology of disease. On the other hand, efforts to promote the induction of specific IFN-signals, may lead to novel, less toxic, therapeutic interventions for a variety of viral infectious diseases and neoplastic disorders. The discovery of microRNAs has renewed interest in post-transcriptional modes of regulation, fueling an emerging view of a rich RNA world within our cells that deserves further exploration. Much work has gone into elucidating genetic regulatory networks that orchestrate gene expression programs and direct cell fate decisions in the hematopoietic system. However, the focus has been to elucidate signaling pathways and transcriptional programs. To bring us one step closer to reverse engineering the molecular logic of cellular differentiation, it will be necessary to map post-transcriptional circuits as well and integrate them in the context of existing network models. In this regard, RNA-binding proteins (RBPs) may rival transcription factors as important regulators of cell fates and represent a tractable opportunity to connect the RNA world to the proteome. ChIP-seq has greatly facilitated genome-wide localization of DNA-binding proteins, helping us to understand genomic regulation at a systems level. Similarly, technological advances such as CLIP-seq allow transcriptome-wide mapping of RBP binding sites, aiding us to unravel post-transcriptional networks. Here, we review RBP-mediated post-transcriptional regulation, paying special attention to findings relevant to the immune system. As a prime example, we highlight the RBP Lin28B, which acts as a heterochronic switch between fetal and adult lymphopoiesis. The basis of cellular differentiation and function can be represented as integrated circuits that are genetically programmed. Identification of the master regulators within these complex circuits that can switch on or off a genetic program will enable us to reprogram cells to suit biomedical needs. A remarkable example was the discovery by Takahashi and Yamanaka (1) that somatic cells could be reprogrammed into induced pluripotent stem (iPS) cells via the ectopic expression of four key transcription factors. Interestingly, a specific set of microRNAs (miRNAs) could also mediate this reprogramming (2, 3), revealing a powerful layer of post-transcriptional regulation that is able to override a pre-existing transcriptional program (4). Similarly, miR-9 and miR-124 were sufficient to mediate transdifferentiation of human fibroblasts into neurons (5). Accordingly, we are enamored by the RNA world and pay special attention in our investigations to regulatory non-coding RNAs (ncRNAs), particularly miRNAs and long non-coding RNAs (lncRNAs) and how they integrate with known genetic regulatory networks (Fig. 1). With the exception of certain ribozymes, regulatory RNAs generally do not work alone. Instead, they are physically organized as RNA-protein (RNP) complexes. Operationally, RNA-binding proteins (RBPs) and their interactome work in concert as post-transcriptional networks, or RNA regulons, in response to developmental and environmental cues (6). Inspired by this concept and other pioneering studies in the worm, we recently demonstrated that a single RBP Lin28 was sufficient to reprogram adult hematopoietic progenitors to adopt fetal-like properties (7). We discuss these and related findings, which begin to disentangle the complex functions of RBPs in the context of recent advances in post-transcriptional regulation, starting with the discovery of miRNAs. Working in C. elegans, Ambros and Horvitz (8) identified a set of genes that control developmental timing, a category that they termed heterochronic genes. Heterochrony is a term coined by evolutionary biologists and popularized by the worm community to denote events that either positively or negatively regulate developmental timing in multicellular organisms. The discovery of two heterochronic genes, lin-4 and lin-28, which encode a miRNA and RBP respectively, is particularly relevant to this review. The lineage (lin) mutants were previously identified and named because they displayed abnormalities in cell lineage differentiation. Furthermore, some of them were considered heterochronic, as adult mutants harbored immature characteristics (retarded phenotype) or, conversely, larval mutants displayed adult characteristics (precocious phenotype). It was not until 1993 that lin-4 was characterized molecularly, because contrary to popular expectations, the gene did not encode a protein but instead a small RNA now appreciated as the first miRNA to be discovered (9). The lin-4 miRNA acts in part by inhibiting the expression of the LIN-14 transcription factor through imperfect basepairing to sites in the 3′ untranslated region (UTR) of lin-14 mRNA (9, 10). However, it was not apparent initially whether lin-4 or lin-14 is evolutionarily conserved, potentially relegating these findings to be relevant only to the worm. Interestingly, Lin28, a gene conserved in mammals, was later identified to be a direct target of the lin-4 miRNA (11). Lin28 loss-of-function resulted in a precocious phenotype, whereas gain-of-function resulted in a retarded phenotype; thus, Lin28 acts as a heterochronic switch during C. elegans larval development (11). The possibility that lin-4 may be an oddity of the worm was dissolved with the discovery of the second miRNA, again in C. elegans, let-7 (12). Unlike lin-4, the evolutionary conservation of let-7 from sea urchin to human was quickly appreciated (13). Importantly, expression analysis showed that let-7 expression is temporally regulated from molluscs to vertebrates in all three major clades of bilaterian animals, implying that its role as a developmental timekeeper is conserved (14). This established miRNAs as a field unto its own that has progressed rapidly with the identification of Drosha, Dgcr8, Dicer, and Argonaute (Ago) RBPs as core components of the miRNA pathway (15). Orthologs of lin-4were eventually found in mammals (mir-125a, -b-1, and -b-2) (16) along with hundreds of novel miRNAs from numerous organisms (17). We now recognize that miRNAs, in complex with the RBP Ago, frequently bind their cognate targets via imperfect complementarity to evolutionarily conserved sequences in 3′ UTRs (18–20) and mediate post-transcriptional repression (21). One diverse group of RBPs appreciated to be important in the immune system, even before the discovery of miRNAs, is distinguished by their ability to bind to AU-rich elements (AREs) often found in 3′ UTRs of genes involved in inflammation, growth, and survival. Such RBPs are known as ARE-BPs and have been implicated in mRNA decay, alternative splicing, translation, as well as both alleviating and enhancing miRNA-mediated mRNA repression (104–107). Genetic inactivation of several ARE-BPs have been linked to aberrant cytokine expression due to impaired ARE-mediated decay (5, 108–111) (Table 1). In addition, deficiency of HuR and AUF1 has uncovered a pro-survival role for both in lymphocytes (112, 113), while ectopic expression of Tis11b (ZFP36L1) negatively regulates erythropoiesis by down-regulating Stat5b mRNA stability (114). The KH-type splicing regulatory protein (KSRP) originally identified as an alternative-splicing factor is a multi-functional RBP. It has been shown to associate with both Drosha and Dicer complexes to positively regulate the biogenesis of a subset of miRNAs including mir-155 and let-7 (73, 108, 115–120). In addition, KSRP, like many other ARE-BPs, mediate selective decay of mRNAs by recruitment of exosome complexes to mRNA targets (121) and constitutes a prime example of a multi-functional RBP. Biological processes involved in the development and function of the immune system require programmed changes in protein production and constitute prime candidates for post-transcriptional regulation. While the ENCODE project initially aimed to identify all functional elements in the human DNA sequence, recent discoveries centered around miRNAs and multi-tasking RBPs, such as Lin28, have highlighted the need for a similar systematic effort in mapping post-transcriptional functional elements within the transcriptome. Integration of genomic, transcriptomic, and proteomic data remains a daunting but necessary task to achieve understanding of the full impact of genetic programs and the enigmatic roles of regulatory RNAs. Mastering the science of (re)programming cell fates promises to unleash the potential of stem cells for Regenerative Medicine.